The Amaze has grown in every dimension and is longer, wider and taller than the outgoing car, while the wheelbase is a significant 65mm longer than before. Stretching the wheelbase immediately benefits cabin space but poses a challenge when it comes to design. “With a longer wheelbase, the C-pillar goes back a bit, which makes it tricky to integrate with the roofline and the boot,” says product leader Hirochi Yamaguchi. To get a cohesive and seamless shape, Honda has tapered the roof towards the rear, for it to flow smoothly into the C-pillar. Overall, the design of the new Amaze is quite striking and nothing like the previous car’s. The buff and vertical nose looks quite unconventional and could split opinion, but what works to make the Amaze look wider than it is, is the thick, signature chrome grille bar and the stretched, flat bonnet. In fact, the extra width (the track too is increased by 17mm front, 25mm at the rear) makes the 175/65 R15 tyres (which now sit on larger 15-inch alloys) look a size too small. The sides are a lot cleaner and get a single character line which looks neat but not quite as distinctive as the prominent two slashes across the earlier Amaze’s flanks.At the rear, the Amaze is significantly different and looks really premium, with the chunky C-shaped tail- lamps giving it a mini-Civic look. Amaze isn’t just grown up on the outside; it’s a significant step up on the inside too – be it space or appeal. The two-tone dashboard might seem a bit busy with lots of design elements, but, more importantly, offers a big jump in the quality. The plastics though not ‘soft-touch’ are nicely textured and have a premium feel. Certain bits like the steering controls, climate control knobs and buttons are superbly finished and the meaty steering wheel is great to grip. A huge improvement here is the front seats, which now get adjustable neck restraints and high-quality fabrics. The redesigned seats are well-contoured and offer good support. In fact, it’s safe to say that these are amongst the comfiest seats in a compact sedan. The touchscreen is smooth to operate and it is easy to navigate through the various menus, but the hard buttons on the side are too tiny and feel flimsy to operate. Also, we wish Honda offered a good old-fashioned rotary knob for the volume. The Amaze comes with both Apple CarPlay and Android Auto in addition to satellite navigation, which is now de rigueur in today’s competitive market. The outgoing car was very spacious at the back and this new one carries forward that strength. The back seat is very comfortable with a comfy recline angle and ample thigh support. Legroom is huge too for a car of this size, and because the front seatbacks are scooped in, knee room is ample. It does have certain flaws though like the headroom isn’t generous and six-footers could brush the roofliner. Also, the fixed neck restraints are quite useless for taller passengers, in the event of a rear-end collision.Although the new Amaze misses out on rear air-con vents, the air-con compressor has been upgraded to larger capacity units, and yes, it cools the cabin very rapidly. All in all, this engine gearbox combination works better than the petrol CVT Amaze if you are after effortless performance and efficiency In the corners, the Amaze isn’t as sharp as the Ford Aspire or even the Maruti Dzire but feels balanced nonetheless and offers good body control and feedback from the steering which contribute to above average dynamics in this segment. As for the ride quality, the car absorbs most of the rough stuff with ease thanks to the well calibrated dampers. Still, expansion joints and sharp-edged inconsistencies can be felt in the cabin and at high speeds there is some amount of vertical movement especially when the car is loaded. It’s not a deal breaker though just a point worth making. In terms of performance and handling capacity, the new Amaze comes impressive compared to the old model. 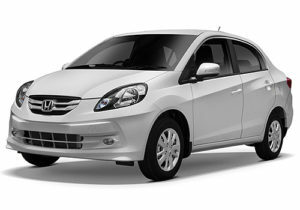 Honda has refined the handling of this car compared to the predecessor, while performance too has been improved.Ride comfort is one of the key strengths of this Amaze. It handles rough roads very capably and doesn’t toss around passengers on broken roads. Body movements are very well controlled too. If there was one concern though, it was that, with four passengers and luggage, the rear of the car bottoms out (just like the older Civic) on speed breakers, as a result of the soft rear suspension and long wheelbase. The steering has a bit of vagueness around the centre position but it remains well-weighted and precise as the speeds build. Overall stability is fantastic and the new Amaze has a secure, planted feel of a bigger car. It dives into corners with a new-found confidence too; so this family car can still be fun around the bends and curves. The new Honda Amaze gets several safety features that include dual front airbags, ABS with EBD, child seat anchor points and seatbelt warning. The structure itself is capable of absorbing impact offering better protection to the occupants. In terms of equipment though, the top variants feature cruise control, keyless entry/go, tilt steering adjustment, touchscreen infotainment system, climate control and the petrol-automatic gets paddleshifters. Safety kit like ABS, EBD, dual airbags and Isofix child seat mounts on the rear seat are standard across the range.